Last season North Dakota State and South Dakota State played in the conference championship game for the second time in three seasons, with the Bison evening the score against their neighbors to the south. This season, with each team losing its best player to graduation, might there be room for someone else to take the reigns of the Summit League? Although anything can happen in a one game scenario, especially between rivals, it was somewhat of a choke job for South Dakota Sate to not win the conference tournament last season. The Jackrabbits led the league in both offensive and defensive efficiency, and had a 50 spot lead in KenPom over its next closest foe. Still, led by Lawrence Alexander, North Dakota State managed to win the league tournament for the second year in a row. Alexander ranked second nationally in minutes played and was in the top 50 nationally in 3-point percentage, making 44.5 percent of his 227 attempts behind the arc. The eventual heir to Alexander might be Fargo native AJ Jacobson. As a freshman, Jacobson shot 38.6 percent on 3-pointers and attempted 127 of them, second most on the team. He struggled inside the arc, but chipped in on the boards and took care of the ball relatively well for a freshman. He, along with fellow North Dakotan Dexter Werner, are two of the breakout candidates in the league. Werner, a native of Bismarck, shot 50 percent from the field and ranked 35th nationally in offensive rebounding last season. However, he was limited to playing under 20 minutes per game due to not being in fantastic shape. The most fun league in the team is Nebraska-Omaha. Although the Mavericks don’t have much chance to win the league’s autobid, they were the third fastest team in the country last season, allowed a ton of points, and forced a lot of turnovers. The Mavericks won just five league games last season, but only lost to the Bison by a combined 10 points in the teams’ two meetings. The potential is there for the Mavericks to make a splash or two this season, especially if they can improve on their ranking of 283rd nationally on defense. Once again, however, South Dakota State looks like the runaway favorites. 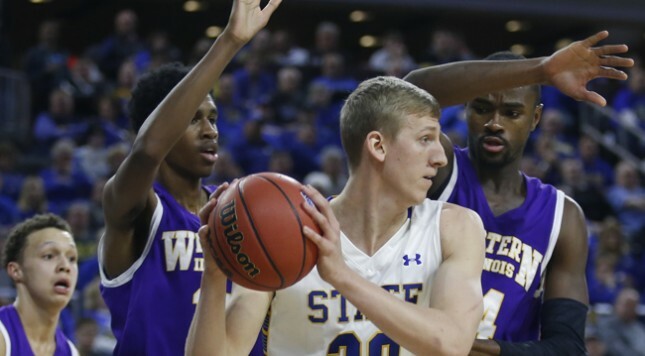 The Jackrabbits lose Cody Larson, the team’s best player, and Zach Horstman, to graduation, and little used Anders Broman to transfer, but they will start three seniors and will hopefully get a full season out of Connor Devine, who played in just 23 games last season. Devine, a 6-10 junior from Alaska, had a block percentage of 12.6 percent last season. The Jackrabbits scored 1.12 points per possession and allowed .95 points per possession in conference play last season, both best in the league, and although they’ll take a step back thanks to Larson’s departure, they have enough cushion above the rest of the league to comfortably still be the conference’s best team.